Powers/Abilities: Baron Skullfire possessed superhuman strength and durability, and was immune to conventional small arms. He could project hellfire from his hands, and was a skilled combatant. He carried a cane topped with a snake's head; whether this had any special properties remains unrevealed. His chosen steed was a hellfire-enhanced rhino. 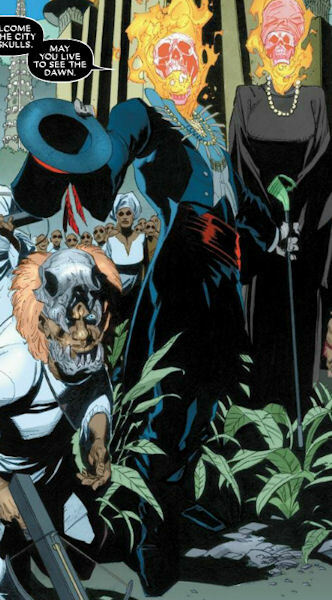 History: (Ghost Rider VI#31 (fb) - BTS) - Baron Skullfire was an African Ghost Rider who worshipped Papa Legba and whose appearance was based on the memeform of Baron Saturday (Samedi, a.k.a. Sagbata). He was partner and lover to Marinette Bwa Chech, and the pair operated from the hidden City of Skulls deep within the Congo, whose inhabitants they protected and were served by in return. As the acolyte-like Phantom Riders, the City's inhabitants guarded the City against intruders. 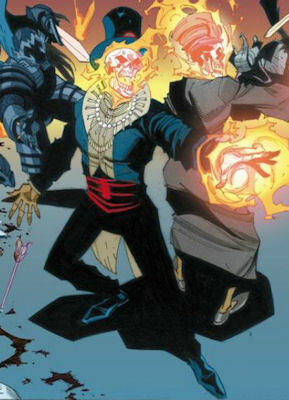 The two Ghost Riders became close friends with the Muslim Ghost Rider Molek, and the Baron and Molek (and perhaps Marinette) fought together alongside legions of other Spirits of Vengeance as the Order of the Midnight Sons. In modern times the couple learned that their fellow Spirits of Vengeance were being hunted down and destroyed by rogue Ghost Rider Dan Ketch, who had been duped into this action by the even-more rogue angel Zadkiel, who wanted the Spirits' power to conquer Heaven. 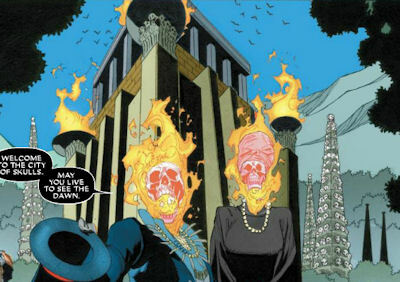 (Ghost Rider VI#31) - The last handful of remaining Ghost Riders - Molek, the Chinese Bai Gu Jing, and Ketch's brother, Johnny Blaze - plus their ally Caretaker (Sara) came to the City of Skulls intending to make a last stand alongside the Baron and Marinette. The skeletal couple warmly greeted the new arrivals, welcoming them to the last stand of the Spirits of Vengeance, with Skullfire dryly wishing that they might live to see the dawn. Despite being happy to renew their acquaintance, Baron Skullfire noted how few their number were compared to the old days, and wondered if what was left would be enough, but Molek pragmatically noted that it would have to be, and the Baron then led the visitors into the city, inviting them to eat and drink like this was their last night on Earth. Some time later, after the visitors had gone to their quarters, the Baron and Marinette made love while still in their transformed, skeletal states. The next day the forces of the City of Skulls assembled, ready for the coming fight - Molek, Bai Gu Jing, Baron Skullfire and Marinette Bwa Chech, Sara, and the City's human population, the Phantom Riders of the Congo. The Baron made a rallying speech to the Phantom Riders, telling them were not fighting for their homes or lives, but for their very souls, and the souls of their ancestors, and proclaiming that if their enemies sought to claim a place in the spirit world, then the city's defenders would show them the way to Hell. 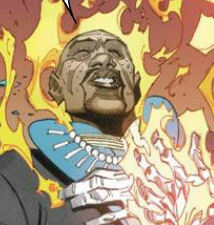 At the last moment Blaze joined them in his Ghost Rider form. Seconds later the similarly transformed Dan Ketch raced out from the treeline, leading an army of Zadkiel's Black Host angels. 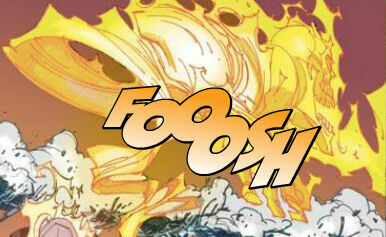 The battle ended, Ketch dissipated his avatars, absorbing the power they had taken. Stealing Blaze's power too, he flew up towards Heaven to deliver the combined might of the Spirits of Vengeance to Zadkiel. Blaze, weakened but alive, returned to the City of Skulls to find only Sara still standing. Moments later, having learned too late of Zadkiel's villainous intentions, Ketch crashed back down to Earth, having managed to hang on to just enough of the power to restore Blaze's Spirit of Vengeance to him. Lying amidst the carnage, Ketch dejectedly announced that Zadkiel had won. 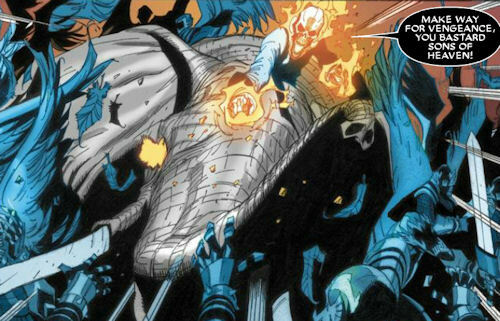 (Ghost Rider: Heaven's on Fire#6) - Like all past Ghost Riders, Baron Skullfire was revived to take part in defending Heaven from first Zadkiel and then Kid Blackheart's demon army. After the battle, Heaven lit up as God returned, and the resurrected Ghost Riders returned to their eternal rest. Comments: Created by Jason Aaron and Tan Eng Huat. 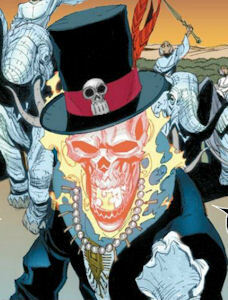 The script for Ghost Rider VI#31 confirms that Baron Skullfire's look is based on Baron Saturday, or Samedi as he is usually known on Earth-616. The City of Skulls may have been inspired by the short story The Lost Expedition, or the City of Skulls, A Story of Western Africa by David Ker, which appeared in fourteen installments in The Boy's Own Paper starting from #597 on June 21st 1890. Or perhaps it is a reference to Shamballah, the City of Skulls and capital of ancient kingdom of Meru once visited by Conan, which first appeared in L. Sprague de Camp and Lin Carter's 1967 short story, also titled The City of Skulls, and was adapted by Marvel in Savage Sword of Conan#59, December 1980. However, while that City definitely existed on Earth-616, it can't be the same city seen here, as Conan's City of Skulls was located in what is now Asia, not Africa. Baron Skullfire's chosen steed was a rhino, presumably hellfire-enhanced like other Ghost Rider steeds. He didn't stay on it long during the battle to defend the City of Skulls, so it may have been slain early in the fight. 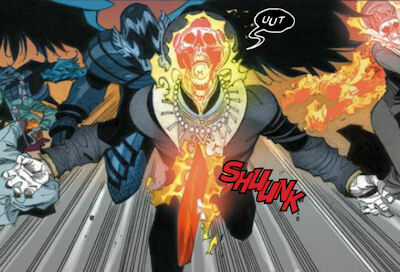 When Baron Skullfire was slain, his Spirit of Vengeance visibly exited the corpse and took a new host from amongst the nearby Phantom Riders of the Congo. Comments: While Spirits of Vengeance are always presented BTS during stories involving their hosts, it is rare to see one without a host, making this appearance of especial interest. When Baron Skullfire was slain, an unidentified Phantom Rider atop an elephant was taken by the Baron's Spirit of Vengeance as a new host. 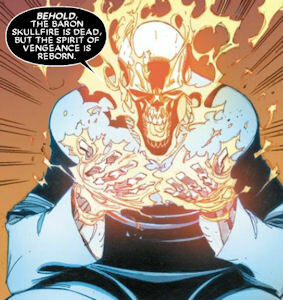 The new Ghost Rider did not apparently pick a name for himself (he wasn't Baron Skullfire, given his proclamation that the Baron was dead) in the short time he remained empowered. 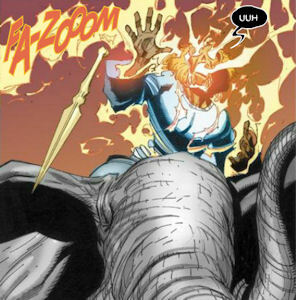 He tore through the enemy with his hellfire-empowered pachyderm, but, though it was not depicted on panel, he was subsequently depowered by Dan Ketch's hellfire avatars. Comments: It is uncertain whether he was slain as well, or if he was subsequently present at the battle for Heaven - Baron Skullfire was present, and since the successor shared the Baron's Spirit, he may not have been revived, but since the Spirits used to absorb one another, presumably the Baron and his successor would not have been the only cases of two hosts having shared a Spirit, and the assemblage allegedly included all the past Ghost Riders. 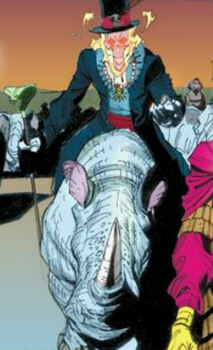 After becoming the new host to the Baron's Spirit of Vengeance, his successor enhanced his elephant steed with hellfire. With burning eyes and tusks enlarged and hardened like razor-sharp steel, it smashed through the Black Host with ease, but presumably finally fell in battle off-panel. The City of Skulls, also known as the secret citadel of the Congo, was located somewhere along the Congo River, though in exactly which country remained unrevealed. It was ruled by the Vodu-themed Ghost Riders Baron Skullfire and Marinette Bwa Chech, and its inhabitants, even the youngest child, were members of the city's defensive force, the Phantom Riders of the Congo. As its name suggests, the architecture was heavily-skull themed, with towers apparently constructed out of human skulls. 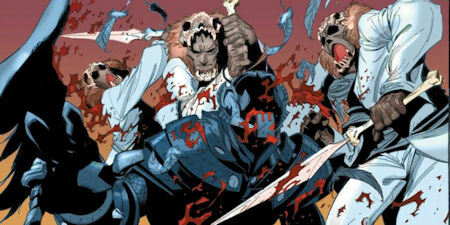 The Phantom Riders of the Congo were the inhabitants of the City of Skulls. Armed with swords and rifles, and riding atop white elephants, they fought valiantly against Dan Ketch and the angelic Black Host, even succeeding in slaying many of their supernatural opponents. Ultimately all of them fell in battle, though some may have only been wounded. 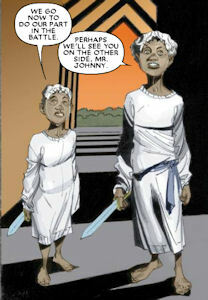 When Johnny Blaze arrived in the City of Skulls, two curious children asked if they could ride his motorbike. Not in the best of moods, he declined. As the battle approached, they visited him in his quarters, where the despondent Johnny was trying to rest, not intending to fight. Without looking at them, he rebuked them for bothering him, angrily assuming that they wanted to ask again for a bike ride, and telling them that he wanted to die alone and they could all go to Hell. They apologized, and explained that they had only come to say goodbye, and when Johnny turned he saw they were dressed for battle. As he watched them walk off to join the City's other defenders, his conscience was tweaked, and he realized he could not sit out the fight.